Drag and drop the points to move them. Right click on the point to delete it. Single click anywhere on map to add a new point at the end of the route. Click the route to add a point in the middle of route. Double click anywhere on map to add a new point and zoom in. Use a mouse wheel or + and symbol to zoom in or out. Right double click anywhere on map to zoom out. Click a point to edit it. It will start jumping and the point options will be displayed. Point name – add a name for the point. Color – pick a color from the list. The point color will change on map. Also the line between this point and the following point will have the chosen color. 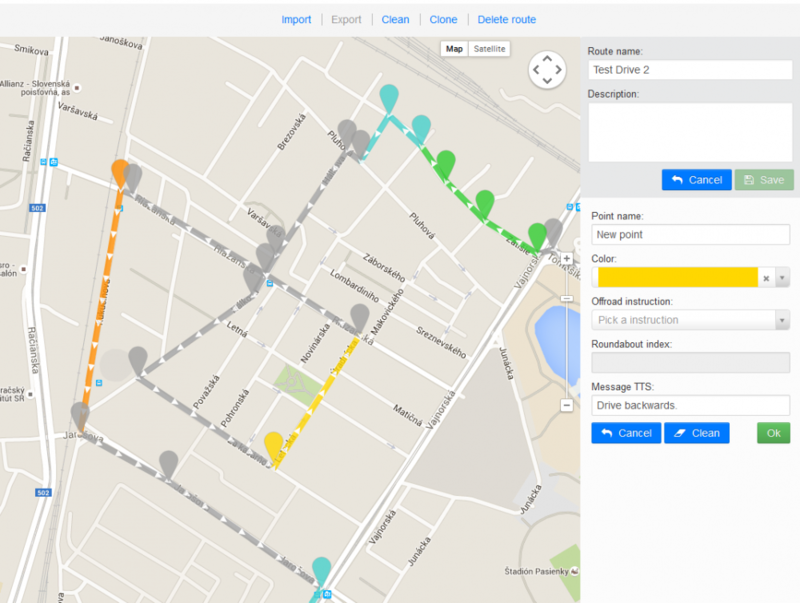 Offroad instruction – The preplanned route’s navigational instructions when using turn by turn navigation with a Mobile client, are generated according to the line geometry, not according the road structure. If you want to give better instructions for complicated junctions or roundabouts, you can redefine them. To do so, select an instruction from the list. There are several types of roundabouts to choose. The navigational isntruction is the same for all of them, they differ only in icon, which is displayed. Roundabouts are marked by the cardinals where the roundabout exit is pointing related to the entrance of the vehicle. First six are an icons for right side driving, the second half marked with _LS are for left side driving (LS = left side). 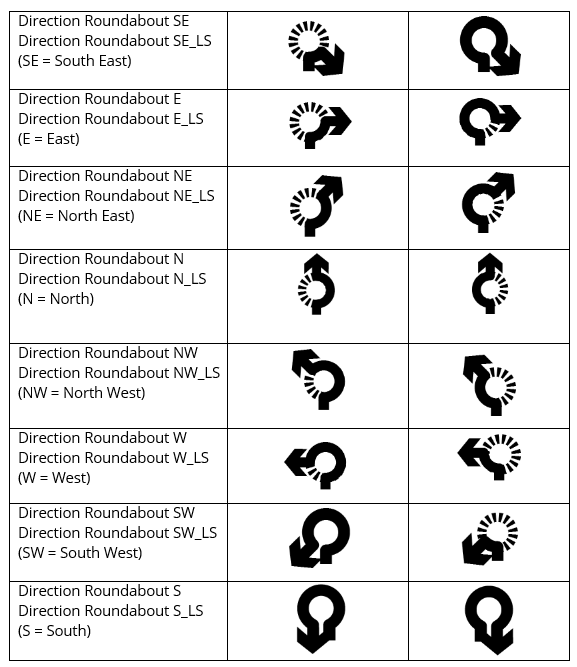 If you pick a roundabout instruction, you should define a Roundabout index too. Roundabout index – the number of the exit from the roundabout. It must be specified only if you select a Roundabout as an Offroad instruciton. All the points you edited will appear in the point list on the right. This way you can easily find or edit them. Each point has a rubber and cross icon next to them. Rubber icon cleans the point. It means, that the point remains in the map, but all the attributes like custom instructions or colors. Cross icon deletes the point from the route. Only saved route has these options. Tap Clean to remove all the points from the current route. The route is not deleted. Tap Clone to create a clone or copy of this route. Tap Delete to delete the route.